Storebought naan bread crisps up perfectly to make a quick, delicious personal pizza. 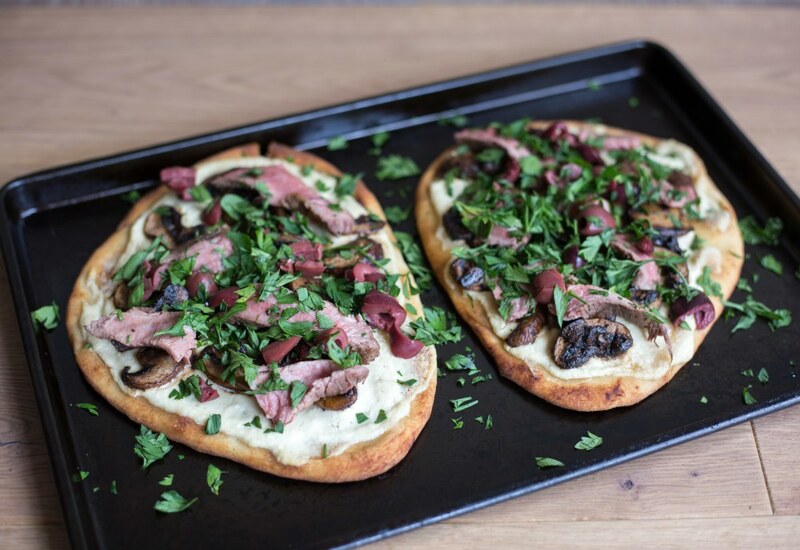 This Mediterannean-inspired pizza is topped with a whipped feta-tahini sauce, sliced steak, sautéed mushrooms and olives. Goat cheese makes a great substitution for the feta in this recipe. Per Serving: 651 calories; 38g fat; 53.8g carbohydrates; 25g protein; 65mg cholesterol; 1215mg sodium. oh my gosh, this feta spread is addictive. we had a little leftover and spread it on toast with more mushrooms and a fried egg for breakfast the next day. what an easy, delicios recipe! I love naan pizzas. This steak and mushroom version is super tasty! These are so quick and easy, I love popping them in the oven on a lazy Friday night.